Worryingly, around 50% of UK horse owners do not vaccinate their horses against flu and 40% do not vaccinate against tetanus, putting a large proportion of our horse population at risk. The last thing you want is for your horse, or any horse, to get ill, so prevention is always the best approach. Although flu does not usually cause long term or fatal illness, it can lead to pneumonia in very young and old horses. It can take from a few weeks to several months for horses to fully recover which could result in them being out of action for a significant period of time. You may be restricted from competing and yard closures can be put into force. If you see signs of flu in your horse, which include a dry cough, nasal discharge, fever, lack of appetite and lethargy, you should isolate your horse and contact your vet. Signs of tetanus, such as seizures and muscle stiffness, can be severe and develop rapidly into a ‘rocking horse’ stance and ‘lock-jaw’. Diseases can also spread indirectly via people, water, feed and equipment that have been in contact with infected horses. Furthermore, equine flu can travel up to 5km in favourable conditions. 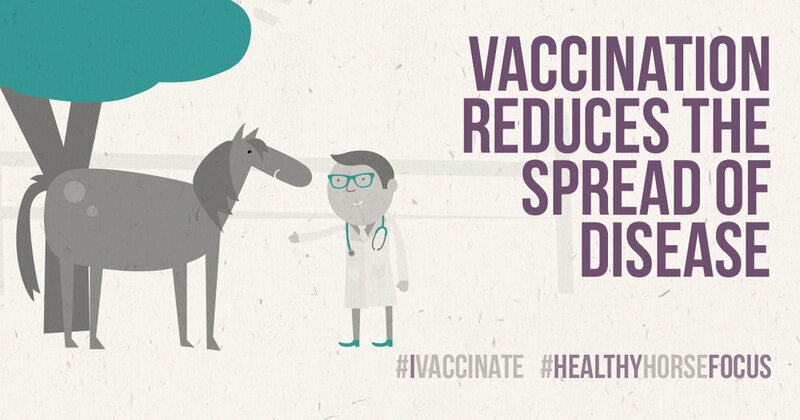 Even if a horse lives alone and doesn’t leave home, he’s still at risk of infection if left unvaccinated. Ensure contact with horses and people off-premises is minimised, especially at competitions. People who visit the yard should regularly wash their hands thoroughly and disinfect boots on entry and exit. Even if he doesn’t leave the yard, your horse may still be in contact with horses who do, which can increase the risk of diseases spreading. Watch the video below to see how easily diseases can spread worldwide. If you are concerned about your horse’s risk of contracting an infectious disease, speak to your vet to put a management plan in place. Do you want to find out more about horse health? Check out the Keeping Britain’s Horses Healthy Facebook and Twitter pages. Keep your older horse healthy and happy with just a few tweaks to his daily routine. With the balmy, summer evenings long behind us, we review some key health issues to help keep your horse at his best this winter. For many riders, back twinges are part and parcel of life with horses. But could your actions now end up playing havoc with your back in the future, and what can you do to avoid problems? Read on for some simple tips to help you avoid back pain when riding, handling and working with horses.